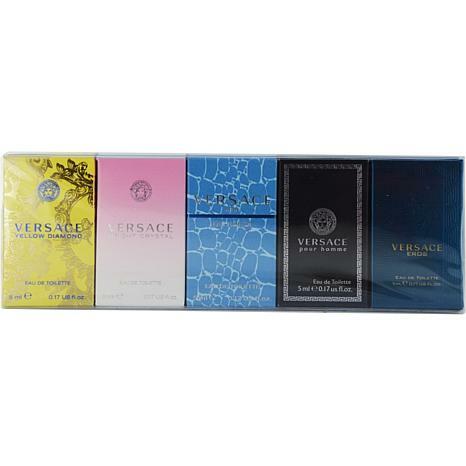 Launched by the design house of Gianni Versace, Versace Variety 5 Piece Unisex Mini Variety With Man eau Fraiche & Signature & Bright Crystal & Yellow Diamonds & Eros And All Are EDT .17 oz Minis is a unisexs fragrance that possesses a blend of Versace Variety is recommended for casual use. This item may not ship to Alaska, Guam, Hawaii, Puerto Rico, or the Virgin Islands using a ground shipping method. Please select an air method when ordering this item for those locations. All Orders must also have a physical address and not a P.O. Box. They all smell wonderful but the small openings on the bottles makes it difficult to get the scent out in small quantities. A spray would work much better but that's a manufacturing issue. Other than that, I'm pleased with the purchase. Great Purchase of samples and now I can choose exactly the one I like best and I Love it! Was expecting larger products for the money.